Lanza's early (1949) studio work for RCA was similarly well received, with one of his discs ("Che Gelida Manina") reportedly accorded the honor of Operatic Recording of the Year by the US National Record Critics Association. By early 1951, however, with Lanza now a household name in the light of his film and recording success (particularly after the release of "Be My Love," which sold almost two million copies), marked criticisms of his singing began appearing for the first time. This intensified after the release of his third film, the extraordinarily successful The Great Caruso. The underlying theme of this criticism was that Lanza was an unformed singer who had no business portraying an operatic legend. Moreover, the tenor's astonishing commercial success was increasingly held against him, with the implication being that he could not be taken seriously as an artist because of the "dubious" way in which he had attained his fame. As New York magazine music critic Peter G. Davis observed in a 2004 discussion on Lanza, critics in the 1950s were "pretty high and mighty" and exceedingly "polarized." Indeed, with the exception of The [Philadelphia] Evening Bulletin's Max de Schauensee, who favorably compared Lanza's "enveloping conviction" with that of "Caruso, Chaliapin and other great artists," most serious music critics at the time adopted, at best, a patronizing tone toward this "film singer." The prestigious British music magazine Gramophone was especially critical of Lanza during the remainder of his lifetime, while in the United States Time magazine and Newsweek both adopted a scathing tone toward the tenor from 1951 onwards, mocking not only his singing, but his weight problem, intellect and character. Time magazine's review of Lanza's fifth film, Serenade, on 9 April 1956 epitomized this attitude, describing the tenor as a grotesque egotist with the appearance of "a colossal ravioli set on toothpicks." Meanwhile most serious music reviewers of the time either ignored what are generally considered the tenor's finest albums—The Student Prince and the Hit Songs from Other Great Musical Comedies (RCA 1954), the largely operatic soundtrack album Serenade (RCA 1956), and the Neapolitan song collection Mario! 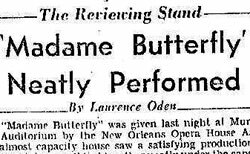 (RCA 1959)—or damned them with faint praise. (Burnett James in a 1960 Record Review article typifies the latter attitude, with his criticism of the Mario! album focusing on Lanza's supposed lack of either "a controlling musical sensibility" or "a feeling for the words"—ironically the album's most lauded and immediately obvious qualities to many present-day listeners.) One curious exception was John Masters of the Australian newspaper The Age, who praised Lanza's singing on the Serenade album—singling out his "dramatically convincing account" of the Act III duet from Otello—while denouncing the tenor's renditions in The Student Prince as "a combination of bawling and whining" from a "a third-rate singer" (see Albums). 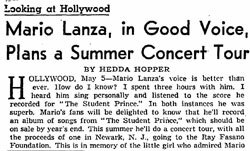 Critical opinion of Lanza arguably reached its nadir in October 1959 when the British critic Leslie Mallory opined in the News Chronicle that, "From any musical standpoint, Mario Lanza never sang—he shouted. . . . The music world will little note nor long remember Mario Lanza's contribution to vocal splendour." Predictably, Time also contributed a dismissive obituary, which included the bizarre allegation that the tenor had been in vocal decline since at least 1954. There was, however, some critical appreciation of Lanza during his (final) recital tour of the United Kingdom and Europe in 1958, even from those who had previously been skeptical of the tenor's vocal prowess. Writing in the Lubecher Nachricten on 14 April 1958, Dr. Kurt Klukist praised Lanza's "blessed southern sensuality" and "smoldering fluency," also noting his surprise that, "[H]e really can sing. The material belonging to this wonderfully melodious tenor is a natural gift. . . . It is difficult to know what to admire the most." With few exceptions, however, critical appreciation of Lanza in the years immediately following his death in 1959 was lukewarm at best, and often accompanied by laments about his perceived lack of style, taste, or nuance. The 1970s saw little improvement. As the BBC's Peter Clayton observed in a 1974 radio documentary on Lanza, "The serious critics either disagree about Lanza, or they ignore him." Nine years later, John J. O'Conner, reviewing the 1983 PBS documentary Mario Lanza: The American Caruso in the New York Times, described the tenor as "a minor figure, almost a curiosity, in the world of music." Critical opinion toward the tenor began to change, however, in the late 1980s, as positive CD reviews in the American music journal Fanfare and the Los Angeles Times appeared, followed soon after by a glowing cover article in the British magazine Opera Now in December 1990. James Miller typified the changing critical view of Lanza. Had the tenor not ventured into Hollywood, he wrote in the November-December 1989 issue of Fanfare, "he would have been one of the star [opera] singers of his time." More recently, the American music writer Clyde T. McCants argued in his 2004 book American Opera Singers and Their Recordings that, "[I]t is time for a serious re-evaluation of [Lanza's] operatic recordings. There is more of value there than his detractors have yet heard—or been willing to hear." And in a largely positive article on Lanza in the July 2010 issue of Opera News, Eric Myers described the tenor as "the ultimate mid-twentieth-century American opera star." Fifty-five years after Mario Lanza's death, it would seem that critical rehabilitation of the tenor is finally underway.